Appealing to everyday Americans can be difficult for politicians, where any misstep can be a fatal blow to a campaign. Presidential campaigns are all about creating an image, a brand. You gotta have a catchy slogan, photo ops, staged events. To put it charitably, these events are messaging opportunities. To put it bluntly, they're marketing gimmicks, and they're as prevalent as stump speeches. A recurring goal is to look like the friendly-but-smart next-door neighbor. Part of the "everyman" routine tends to include projecting yourself as self-made. As Bill Clinton once quipped, "One of our greatest Democratic chairmen, Bob Strauss, used to say that every politician wants you to believe he was born in a log cabin he built himself." Beer is the beverage of choice for trying to look like Joe and Jill Six Pack. Champagne just wouldn't do it. 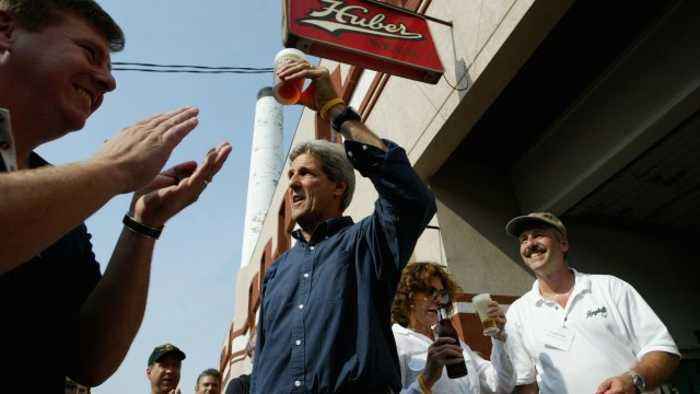 There are pictures of Hillary Clinton drinking beer, and many others: Scott Walker, John Kerry, the list goes on. And photos of sitting presidents knocking back a cool one aren't unusual either. You've seen photos of then-President Obama with beer in hand. 2020 candidates are already chugging along. In this Instagram Live captured by CBS, Sen.
Elizabeth Warren grabbed a Michelob Ultra to celebrate her White House run. Guns are another symbol. Lots of candidates and sitting presidents — certainly not all — find occasions to pose with a firearm. There's probably no better example than President Obama firing a shotgun at Camp David . Or 2004 presidential candidate John Kerry taking a shot. Gerald Ford reviewing a firearm in a velvet-lined case . Sometimes gimmicks get awkward, like when George H.W. Bush had a look of amazement while scanning prices on milk, a light bulb and a bag of candy at the exhibition hall of the National Grocers Association. Now every candidate is required to know the price of a gallon of milk. Some incidents are devastating — like Democratic nominee Michael Dukakis riding in a tank with a big helmet on in front of laughing media in 1988. People still ask him about it. Then there's the trap of trying to look too hip: Remember Hillary Clinton learning to Nae Nae on "Ellen"? SEE MORE: South Bend Mayor Buttigieg Says He'll Stick Out In Crowded 2020 Field Occasionally the moment can even blow back on non-politicos, like Jimmy Fallon mussing Trump's hair in 2016. The host caught hell for months by creating a moment he thought was in good fun. Gimmicks are as American as apple pie. Come to think of it, eating a slice of homemade pie on a family farm — great photo op.